A Gnat and a Virus Team Up Against a Fungus? Scientists have recently discovered a new group of viruses that are full of surprises. Now new research in China has found that these viruses have an odd relationship with an insect. Their findings may change how we protect our crops from fungal diseases and how we think about viruses. 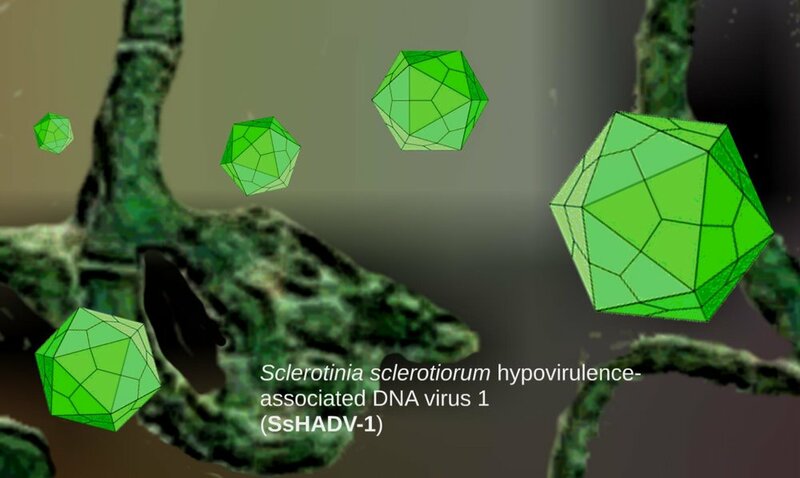 These new viruses are called gemycircularviruses, owing to their circular genome that is single-stranded rather than double-stranded (like all organisms and most other viruses). Scientists first discovered these viruses infecting fungi a few years ago, but since then they have turned up in all kinds of unexpected places, such as patients with HIV, multiple sclerosis, and encephalitis. Even weirder, researchers have found them in dragonflies, horses, rats, and oceanic microbial communities in the North Atlantic. And get this: in 2014 scientists found 700-year-old caribou feces frozen in the subarctic, and in it they found perfectly preserved full-length genomes of gemycircularviruses. One such virus is named SsHADV-1, referring to how it infects a fungus called Sclerotinia sclerotiorum. This particular fungus is a pathogen that damages canola and related crops such as bok choy and turnips. So the question is whether the virus could be used to control the fungal disease. At the Huazhong Agricultural University in Wuhan, China, microbiologist Dao-Hong Jiang is leading an investigation into how SsHADV-1 interacts with the fungus. His team has already made startling discoveries that could aid the control of the fungus. Over 70 years ago, researchers discovered that some viruses infect fungi, and so they were nicknamed mycoviruses. The new group of viruses called gemycircularviruses are also mycoviruses. All mycoviruses were thought to exist only within fungal cells, moving between the fungal filaments. But Jiang’s research team has now discovered that the mycovirus SsHADV-1 can infect its fungal host from outside its cells. During the past century, a debate has simmered about whether viruses are even alive. Viruses have no cells. They are simply strands of DNA or another molecule akin to DNA called RNA, which is one step closer to interpreting the code for proteins. (If your DNA is like a blueprint stored on a computer in binary code, RNA is like the version that has been decoded into illustrated schematics and printed for use at a construction site.) Those strands are tucked into protein capsules of varying shapes, depending on the virus. In fact, SsHADV-1 is actually the first mycovirus discovered to have DNA. One of the basic criteria that something needs in order to be considered alive is the ability to reproduce, but all viruses lack this ability and must rely on hijacking a cell to reproduce. Like Mission Impossible, viruses inject their DNA or RNA into an unwitting cell. The normal protein-constructing machinery inside the cell—that produces everyday enzymes and structures used to sustain its life—is then duped into making viruses en masse. The cell is eventually stuffed with freshly minted viruses and bursts like an overfilled water balloon, letting the horde of new viruses go find other cells to hijack. The entire genomes of viruses are typically quite short, much shorter than some genes in organisms. For instance, SsHADV-1 has only two genes, one for making the protein capsule and another for initiating replication in the host cell. The simplicity of viruses, and especially gemycircularviruses, makes Jiang’s next discovery all the more fascinating. His team noticed that gnats feed on the Sclerotinia fungus. The larvae of dark-winged fungus gnats are notorious pests of fungus, including shiitake mushrooms. The gnat species Jiang’s team found on Sclerotinia is known as Lycoriella ingenua. Seeing these larvae feeding on the fungus made the scientists wonder what happens to the SsHADV-1 virus when gnats are around. By letting viral-free larvae munch on fungi infected with SsHADV-1, they realized that the gnat larvae acquired the virus. As those infected larvae matured to become adult gnats who laid eggs, Jiang’s team was able to see that all stages of the gnat life cycle were now positive for the virus. This meant that the virus was able to replicate itself inside the gnat cells (with no apparent distress to the gnats), and that the virus could be passed on to the next generation of gnats. Then the researchers carefully bathed the larvae. Sounds strange, but they wanted to transfer the infected larvae to a viral-free fungal colony to see if the gnats could transmit the virus, and they bathed the larvae to eliminate the risk of spreading the virus from some circumstantial debris. The test revealed that the larvae could indeed infect the fungus. For the next step, Jiang’s team placed two canola plants into a chamber, one that was infected with the fungus and one that was infected with a virus-infected fungal strain. Viral-free gnat larvae were placed on the fungal lesions on the canola plant that had the virus. And then they waited for two weeks. When they returned, Jiang and his researchers discovered that the plant that was initially viral-free was now positive for the virus. This meant that the larvae acquired the virus, the virus was transferred through the gnats’ life cycle, and the winged adults then shifted to the viral-free plant where they infected its fungus with the virus. Jiang’s hunch was right. The larvae could be a vector for the SsHADV-1 virus. But how likely is the gnat is to be a vector of the virus? Is the fact that it transmits the virus coincidental? To answer this question, Jiang’s research team needed to ask the gnats themselves. So they devised a sort of questionnaire. First question: are the gnats interested in the virus? The research team placed a handful of gnat pupae (the generic term for cocoons) in a chamber with plates of the both viral-infected fungus and the viral-free fungus. When the adults emerged from the pupae, they had the choice of where to lay eggs. As the fungus was on both plates, either would be suitable for their eggs. But the adult gnats chose the viral-infected fungus again and again. Next question: why do the gnats like the virus? To set up this question, the investigators collected volatile chemicals from both the viral-infected fungus and the viral-free fungus. These are like aerosolized perfumes that each gives off. Jiang’s team made a Y-shaped tube. At the ends of the fork they placed the volatile chemicals. Then they put an adult female gnat in the other opening and watched. Time and again, dozens of different females selected the scent of the viral-infected fungus. When the researchers tested the volatile odors to see what difference the gnats could smell, they found that the chemicals were the same in both the viral and viral-free fungi, but they were far less potent in those infected by the virus. So the gnats are drawn to the virus by favoring the less odorous fungi. What’s more, the viral-infected females laid significantly more eggs than those free of the virus. This shows that the virus is actually increasing the fitness of the gnats. Together these results point to a weird purposeful alliance between the virus and the gnat. The SsHADV-1 gemycircularvirus alters the chemical composition of the Sclerotinia fungus so that it becomes more suitable to the Lycoriella gnat, which in turn acts as a vector that can spread the virus to more fungi. This has never been seen in a mycovirus before. In November of 2016, Jiang and his colleagues published their findings in the Proceedings of the National Academy of Science. Normally we think of mutual partnerships forming between organisms—that is, things that have a cell and their own ability to reproduce, like between a bacteria and a flowering plant, or between the plant and its pollinator. But in this case, it is a virus, which is a sub-organism that may or may not really be alive, paired with a multicellular organism, the insect. Yet another criterion of living things is the ability to react to the environment. Viruses can definitely do that. Just ask an AIDS patient who is trying to beat their viral load with a cocktail of drugs. Scientists have basically watched in real-time as HIV undergoes rapid natural selection to become more resistant to medical treatments, which is why the disease is so difficult to conquer. The fact that some viruses are more closely related to each other than others demonstrates that they adapt and evolve, permitting virologists to categorize viruses into families the way other biologists group species. In this sense, we should not be shocked that a virus can have a close association with a multicellular organism. Actually, viruses that cause plant diseases often have an insect vector. Jiang and his team now reveal that the same is true of mycoviruses, specifically this strange little gemycircularvirus. The researchers suggest that the Sclerotinia fungal pathogen could be mitigated in canola fields by spraying SsHADV-1, which will not only directly impact the fungus, but will be taken up by Lycoriella gnats that will transmit the virus to surrounding areas. They also suggest that there are likely many more partnerships between mycoviruses and fungus-loving insects. And now that we know that gemycircularviruses are all around us, we just need to be observant.